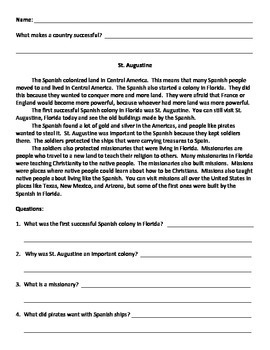 These easy summaries can be used with a United States unit where the focus is the early Spanish, English, and French colonies. They are designed for English Language Learners and low readers. 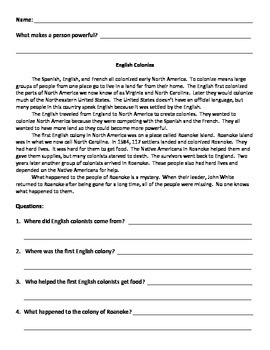 This series includes ten summaries: "Spanish Colonies," "St. Augustine," "English Colonies," "Jamestown," "Jamestown's Government," "French Colonies," "The Pilgrims Arrive," "Life in Plymouth," "Government in Plymouth," and "The Massachusetts Bay Colony." 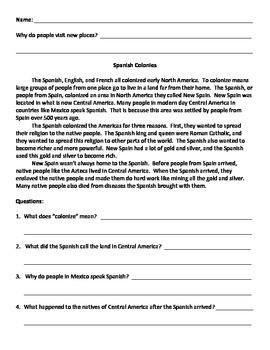 Each page begins with a personal connections question, is followed by simple text about the topic, and ends with four questions about the text.